Nowadays, selling a home is no longer solely dependent on prime location and high-end amenities. Today’s luxury homebuyers are also seeking homes that have eco-friendly features or design elements. With 71 percent of National Associate of Realtors members saying that promoting energy efficient listings was valuable to them, sustainability has never before been such a hot topic. Savvy buyers are acutely aware of the importance of protecting our planet and have been increasingly drawn to homes with the perfect balance of rich architecture and eco-friendly features. As the focus on environmentally-friendly living continues to grow, there are several ways that you can easily upgrade your home with green features without sacrificing a sleek design. 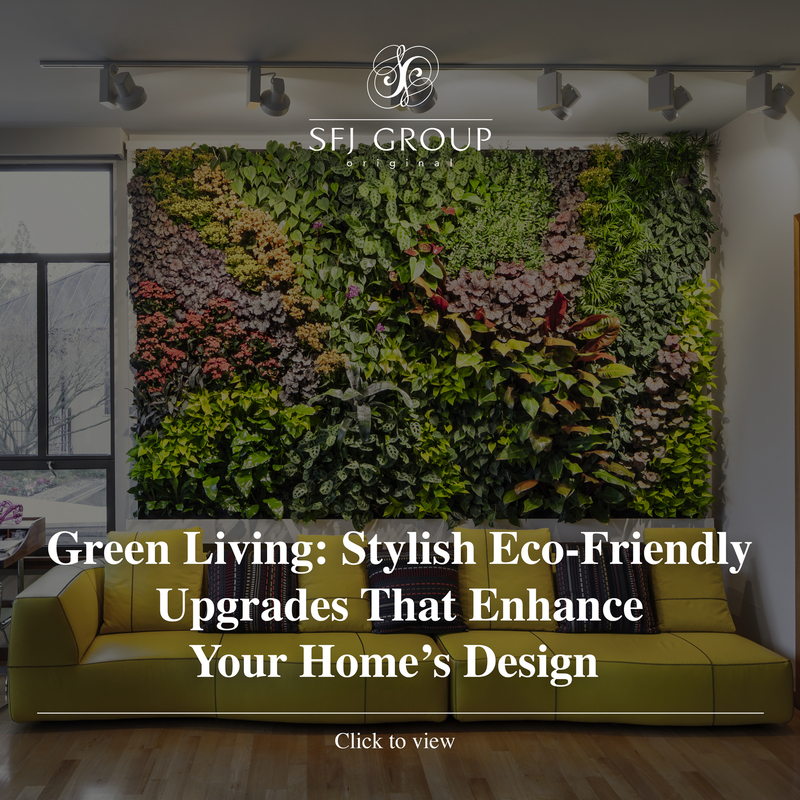 As the focus on environmentally-friendly living continues to grow, there are several ways that you can easily upgrade your home with green features without sacrificing a sleek design. More than just an aesthetically pleasing art piece for living rooms, entry ways or terrace spaces, living walls provide many eco-friendly benefits including natural insulation, energy consumption reduction and humidity level maintenance. Many vertical gardens are designed to survive in full sun, shade or interior building applications and are becoming increasingly popular in hot climates as they require less energy to cool air. With the trend of home gardening and organic produce on the rise, many home owners in urban areas have begun installing green roofs at their properties. An enclosed green space on the extension of an existing roof, green roofs are easy to implement as they do not require extensive backyard space. They provide natural cooling and allow residents to nurture plants in a way that doesn’t include leakages or damages to the roof. In addition to these practical benefits, green roofs also add visual appeal to a home. In Europe, there is already a multi-million dollar market in place for green roof products due to the established technologies and financial support from government legislation. Read more on these green roofs here. Although energy efficient light bulbs have been around for several years, many homeowners are just now starting to incorporate them into their homes due to the many benefits, which include reducing electricity and longer life-span. A report from Everyday Health shows that if each American household exchanged one lightbulb, America would save enough energy to light up 2.5 million homes each year and save $600 million in energy costs. LED lightbulbs, one of the most common energy efficient light bulbs, come in a variety of different colors and can easily fit into many types of designer light fixtures, allowing homeowners to incorporate stylish, yet energy-efficient, lighting design throughout their homes. Home automation is often thought of as a luxe amenity, but it’s also one of the most effective ways to make your home eco-friendly as it allows appliances to run with the lowest amount of energy required. 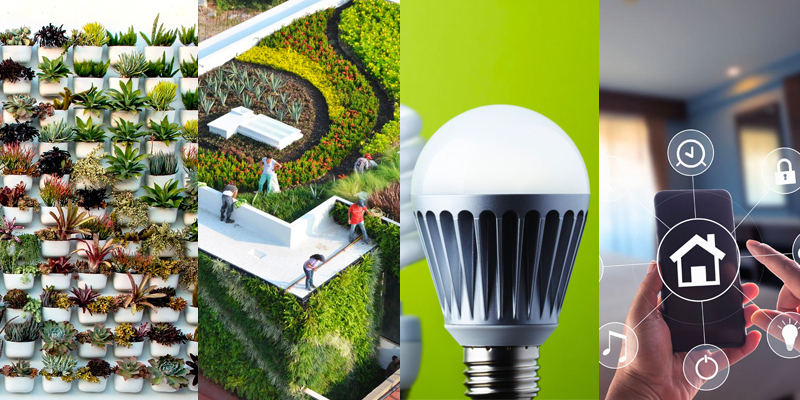 A report from the American Institute of Architects believes that over the next decade, technological integration and dedicated support from our personal devices will bring even more green technological integration into homes. Automated controls for temperature, security and lighting that come from one single device such as the Canary will replace energy-consuming features such as light switches and add extra function simultaneously. Additionally, the sleek design of many of these smart tech devices seamlessly blends technology throughout the home to complete a home’s modern and stylish design.